Thanks to an incredible group of volunteers, we’re delighted to say that we can keep our usual opening hours over the Christmas break. 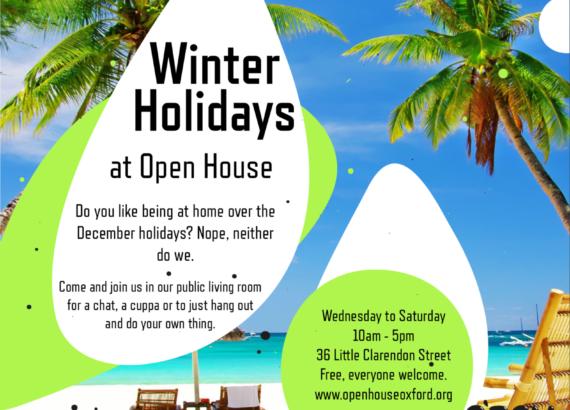 Open House will be open Wednesday to Saturday, 10am – 5pm throughout December and into January. If you need a bit of a break at any point, come and join us. We’re a home away from home, a free space, open to everyone and anyone. We’ve got tea, biscuits, puzzles, board games, loads of kids toys and very comfy sofas. We know that Christmas can be a bit grim for some so please do come and join us if you need a bit of company, more space for the kids to play or you just fancy a change of scene. No need to book, stay for as long as you like and if you need help with your bus fair just let one of our volunteers know.